This title was first published in 2003.The completion of the Single Market and the launching of the European Monetary Union during the 1990s have been accompanied by processes of socio-economic restructuring and major changes in the structure and forms of governance within the dynamic multi-level EU system. 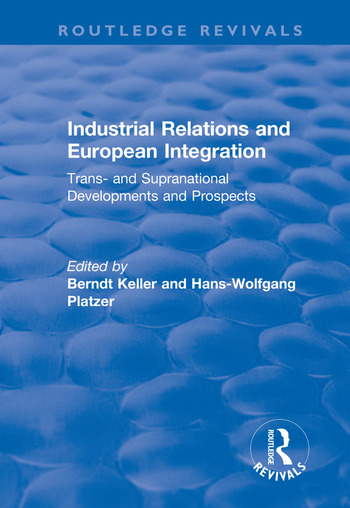 The patterns of reaction and adaptation of national industrial relations systems to these EU - developments are discussed under the heading of "Europeanisation" of national IR-systems. The Maastricht and Amsterdam Treaties have extended - to a certain degree - the scope for legislative and coordinated activities by the EU in the fields of social, labour - market and employment policies. These basic legal and political decisions have created new avenues for the development of transnational industrial relations and the establishment of new arenas for EU - level interaction, including social dialogues between the social partners.